• Cook the soaked dal in pressure cooker with turmeric powder for 5 minutes. • Then take a pan and heat oil in this. • Put mustard and cumin seed and allow it to crack. • Then put red chilies, onion and green chilies till onion turns golden brown color. • After onion is fried then put fenugreek leaves (methi ke patte) and fry for a minutes. • Then add tomatoes in this and put salt along with this. • After tomatoes are cooked add dal into this. • Boil the dal for 2 minutes and serve hot with roti or rice. 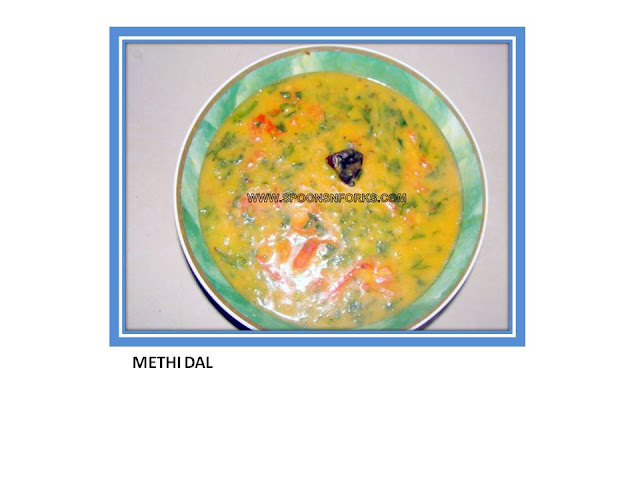 One bowl of methi dal contains nearly 150-160 calories. • If you don’t have fresh fenugreek leaves (methi ke patte) you can use kasuri methi.Only if you have to do that soak kasuri methi in warm water and add into dal with the same procedure.